Honda Power Equipment introduces the Honda VersAttach™ Multi-Purpose System. Featuring two powerhead options and six different attachments, the VersAttach™ System combines the power and reliability of Honda 4-stroke engines with a robust lineup of tools to fit a wide range of lawn and garden needs. The Honda Mini 4-Stroke engine provides for full, 360-degree operation, allowing the VersAttach™ to be used upright, sideways or even upside-down. 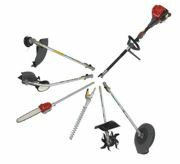 Each model can be paired with an optional interchangeable edger, line trimmer, blower, hedge trimmer, pruner and cultivator. Nordic Plow's Core Collector system includes plow and brushes that attach to the Toro ProCore 648, 864 and JDeere 1500. It is superior in price and quality, lighter on the greens with a safer poly edge and twice the height to collect twice the plugs. Trailing brushes make for a cleaner finish, especially if you top-dress first. Heying Company manufactures a full line of quality equipment for infields, turf and off-field maintenance. Infield Groomers that repair and maintain infields. Turf Groomers for natural and artificial turf. Off Field Maintenance equipment for driveways, parking lots, yards and more. Save time and labor with easy-to-use equipment. Pull with a variety of towing machines. 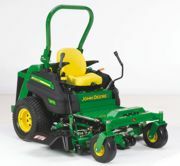 The Z997R is John Deere's most powerful zero-turn mower featuring a 37.4-horsepower Final Tier 4 diesel engine. The Z997R excels in the toughest mowing conditions with front-mower-like power in a zero-turn mower while providing the productivity and dependability commercial landscaper contractors value. The model comes equipped with a 60-inch/72-inch 7-Iron™ PRO side discharge deck, an industry-exclusive 60-inch 7-Iron™ PRO Mulch On Demand™ deck, or a 60-inch 7-gauge fabricated rear discharge deck. Shift into multitasking mode with VersAttach™, a configurable, removable track-based bed attachment system for Caryall® utility and transport vehicles. Ideal for turf or ground management, it accommodates tools and equipment on holders that fit inside and outside the bed. This frees bed space, protects gear and reduces round trips. Features: standard, ratcheting and long tool holders; backpack blower racks; ladder racks; short and long bed dividers; and cargo tie-downs. Marking one synthetic turf field for multiple professional sports requires rapid changeover. The Eco TempLine™ paint system offers low-VOC formulations, easy removal and zero fumes. An environmentally friendly solution, TempLine adds value to the venue, increases player safety and extends the life of the field, all while delivering superior performance and opacity. The EcoLiner™ Plus Battery Powered Field Striper features a heavy-duty diaphragm pump powered by a 12-volt battery. The efficient spray nozzle design and detachable spray gun allow for greater flexibility to meet your field marking needs. The Eco-Liner™ Plus is equipped with a rapid-charge 12-volt plug-in battery charger, onboard clean water reservoir for instantaneous purging of the spraying system, and dependable no-flat tires that meet the rigorous demands of uneven turf. The ECHO BRD-280 Bed Redefiner is designed to help shape flower bed edges that have rounded over time and help keep grassy areas looking manicured with well-defined bed edges. The BRD-280 is lighter and easier to use than current wheeled products and it's up to seven times faster than a shovel. It features ECHO's 28.1cc professional-grade two-stroke engine for plenty of cutting power, ergonomically comfortable rubber handle grips, a 59-inch straight shaft with flex cable drive, an oversized, high-impact plastic shield with guide marker and a large adjustable support wheel.